South Africa's economy contracted by -0.7% q/q (seasonally adjusted and annualised) in 2Q18, the second consecutive contraction, which confirmed that the country entered a technical recession in the second quarter. The print was significantly worse than we had anticipated, but can largely be ascribed to historical revisions that stretched all the way back to 1Q17. While these revisions had no impact on the 2017 economic growth rate, 1Q18 growth was lowered to -2.6% q/q from -2.2% initially. Growth was dragged lower by five of the ten sectors of the economy, underscoring just how broad-based the weakness is. Agricultural output fell -29.2% q/q, subtracting -0.8 percentage points (pps) from growth, while transport sector growth fell -4.9% (-0.4 pps). The manufacturing, trade and government sectors contracted by -0.3% q/q, -1.9% and -0.5% respectively, shaving a combined -0.4 pps from the headline number. The only sectors to make any meaningful positive contribution were mining, construction and finance, real-estate and business services, all of which came off a very weak base. We don't expect their positive contribution to last. In short, there were very few, if any, positives to take away from the figures. Furthermore, government does not have the fiscal headroom to add any impetus to growth, particularly as current spending continues to crowd out infrastructure investment. This was borne out by government fixed investment contracting by -2.1% q/q, and SOE investment falling -10.1%, while compensation of employees for the government sector increased by 7.5% y/y - the average for all sectors was 6.6%. There is also no support coming from the household sector, as household consumption dropped -1.3% q/q, with clothing, transport and recreation spend bearing the brunt of consumers tightening their belts. Data at hand thus far, including the August PMI and August vehicle sales, suggest that growth for the rest of the year will continue along these lines, and we believe that growth forecasts will inevitably miss on the low side this year, jeopardising tax revenue and fiscal consolidation targets, and in turn, drawing the unwanted attention of rating agencies. Customer Service is by no means the ambit of only large organisations with dedicated customer care or customer relationship management departments - it's a fundamental foundation-stone that should be applied in any business, no matter what it's size or nature of business. Basil O'Hagan, author of the book, World Class Customer Service for South Africa, shares some of his research with us. Over and above a welcome sign or greeting, some businesses find that putting up a sign offering all visitors to their premises a '5-Star Service Guarantee' works effectively. They place five golden stars underneath their promise, which serves a dual purpose. Firstly, it reminds staff to keep service levels high, and secondly, it puts customers at ease. Moreover, if the environment and the manners of the staff make customers feel welcome and comfortable, they're more likely to spend time and money on site. If you have a waiting area, consider placing a proper coffee machine in sight, with fresh milk and sugar/sweeteners in tasteful containers alongside. Make sure used mugs and cups are collected regularly and never leave used containers in sight of visitors. Likewise, if your reception area is a waiting room, such as in the case of doctors or professional practitioners, get rid of old dusty magazines. Train staff, even those who answer telephones, NOT to rattle off your company name or their own name so quickly that it is incomprehensible. It smacks of laziness and gives the impression that your staff are simply 'going through the motions' of tedious daily tasks. A strong greeting that is clear and in a welcoming tone can make all the difference. People want value. An effective way to deliver that is to offer a token gift with every purchase. It doesn't have to be something too expensive, sometimes a sweet or chocolate will do the trick. The gesture increases the likelihood of a positive customer experience, just remember that it won't make up for bad or poor service. If something goes wrong, and a long queue develops, make sure staff who are able to move around don't hide away behind counters; they should go out onto the floor and address the group of waiting customers. Whatever the reason is, communication is the key to managing this kind of situation. In a previous article we likened the wave of interest in cryptocurrencies to the diamond and gold rushes in the previous century. The analogy is close in that cryptocurrencies have both miners and traders, and the mined product has little real value but derives its' value by agreement that it is a store of value and a medium of exchange. What makes cryptos so different from gold or money is the enormous power of the distributed ledger. Cryptos are the first largescale use case for distributed ledgers but cryptos are by no means the only use of this world changing technology. Few people get excited talking about ledgers. It just feels like accounting 101 all over again. Ledgers are far more than a record of accounting transactions, as a ledger can consist of any data that is governed by rules. At a high level there must be an agreement about what is in the ledger, when the data is allowed to change and a trust that the ledger is accurate. Speculation is that distributed ledgers will be as big an innovation as antibiotics, fertilizers, GM foods, computers and cellphones. Ledgers form the fundamental basis of market capitalism by defining the value items that we own, our identity, our status as a citizen and even who can make the rules (and their levels of authority). Ledgers currently record everything from your bank account, to your passport, to whether you are married and even to who sits in parliament. Thanks to RMIT Blockchain Innovation Hub who have given us a brief, 4,000-year history of evolution of ledgers. Ledgers have been around since Babylonian times, when baked clay tablets were used to record a range of items from taxes to live-stock. The next big improvement came in the 15th Century in Italy, with the widespread adoption of the paper based double entry bookkeeping. With this innovation, multiple ledgers or journals could be kept in sync, with detailed and general ledgers. This lead to the first profit and loss calculations and a balance sheet could be compiled to track the value of assets, debts and owner's equity. The Venetian Merchants in the 15th and 16th centuries were using double entry accounting to analyse the income statements and capital allocation of their fleets of trading ships. The merchants used accounting to invest wisely and only in valid projects. This resulted in overall savings for the society and an economic boom. Along with double entry bookkeeping, the merchants benefited from limited liability partnerships (companies) and merchant courts to regulate trade. Unfortunately for the Venetian's, a risky sea route was found around the tip of Southern Africa, leading to the collapse of the centuries old silk trading route. Traders now had an opportunity to own the supply chain from the East, which lead to the formation of the first large multinational companies (the Dutch and English East India Companies). This was the start of the rise of large corporate firms and large government bureaucracies. The ledgers are maintained by a central authority and the firm's value depends on how well capital and contracts are managed. The firms needed central structures to maintain contracts with customers, suppliers, employees and regulatory bodies. The management of ledgers required so much of the company's resources that firms grew bigger to benefit from economies of scale. With the development of computers in the 1970's, ledgers were digitized onto databases, but the databases are still only as reliable as the individuals controlling the data within them. We have seen some spectacular losses in large multinational banks and firms (Enron, Lehman's to Steinhoff). Customers and investors trusted that the central authorities in these firms was maintaining and validating their centralised ledgers correctly. This is exactly the problem that the distributed ledger - blockchain solves. It uses a system of rules (or protocols) that enables developers to ensure trust by programming code. This is a completely new way of working. Trusted transactions are conducted directly between two or more parties, which are authenticated by a mass collaboration of people powered by collective self-interests, rather than by large corporations motivated by profit. The early internet dealt solely with the flow of information, emails, articles and social media. Blockchain has started what is termed the internet of value, which could record your assets or physical items that have value to you. Especially relevant are cases where the items are connected to the internet (so called 'internet of things'). Combine this internet connectivity to 'smart contracts' and the true power of blockchain emerges. Smart contracts help you exchange money, property, shares, or anything of value in a transparent, conflict-free way while avoiding the services of a middleman. Not only does the contract specify all relevant details, but it also can automatically enforce obligations. A typical use case could be that your business supplies a product that goes through many links in a supply chain. At each link the item's data is kept on the blockchain. The final stage a customer agrees the sale and guarantee terms on a pre-formatted digital contract. The contract is validated by hundreds of people, and any changes on the contract would notify all the people. Your business knows instantly to whom the item belongs, when it was bought and even to make a new item. Each party in the supply chain can see the product's secure digital record, which can automate certain tasks and payment. The role of accountants, lawyers, auditors to enforce the contracts will be dramatically reduced. Blockchains can be used by firms, but they can also be used to replace firms. Management of central ledgers of contracts and capital will shrink, reducing information and transaction costs. Economies of scale will reduce and small businesses will be as efficient as large corporates. This blockchain revolution has not however, proved to be plain sailing. Smart contracts are limited by what can be specified in the data and algorithms. Creating data that represents physical digitized assets has proved difficult. Firms have proven to be fairly poor at maintaining records of ownership and value of assets. This is set to change as several financial institutions are experimenting with blockchains to house distributed ledgers for brokers, clearing houses and settling trades. This could change the current structure of financial institutions, by removing a layer of middle men and making trades instantaneous. It's likely that in these developments a large number of similar blockchains will be generated. It will take some time for certain blockchains to become recognised as the standard. Like the merchant courts in Venice, there will be a lot of work required for trusted advisors to develop and maintain these blockchains. Ledgers are set to be around forever, but the real use case to watch out for, is where the ledger achieves an economic activity that was previously impossible. Blockchain technology is so new that it's ripe for entrepreneurs to match the capability with an economic need. Do you disrupt or optimise to achieve innovation? Every 60 seconds, the world creates an average of 98 000 tweets, 695 000 Facebook updates, 11 million instant messages, 168 million emails and over 1,820 terabytes of data. The modern-day business must search through all of this to try to identify trends that can inform product and service development, or it can choose to totally disrupt. Business analytics appears to be moving away from the "disruptive innovation" fad to a more balanced approach that requires interpreting data in a way that can inform decisions about whether to optimise existing systems and models, or totally disrupt the market with a totally new way of doing things. It can be shortsighted to perceive disruption as the only form of innovation - sometimes optimisation is the ultimate form of innovation because it looks to solve a root cause of a problem by fixing rather than replacing altogether, so understanding the difference between these two approaches is crucial for businesses. Disruptive innovations are defined as technological innovations that are often 'ahead of their time'. The first automobile was not immediately mainstream, neither was the telephone that replaced the telegraph, the PC that replaced the typewriter, or Wikipedia that replaced the encyclopedia, all of these fit the definition of disruptive innovation. Businesses that survive and thrive need to understand what drives their business - not only demand and supply factors, but also what kind of sales conversations they need to have to enhance customer experience. These factors relate to optimisation, and would form a foundation for later disruption, because without extracting insights from the data gathered, and combining this with research that can build new business models and enable the experimentation of new ideas, success might be compromised. The successful implementation of disruptive ideas comes with viewing data as a flow of information, rather than at a specific point in time, so it's important to avoid viewing each customer event as an isolated incident, and to rather consider the entire lifecycle of that customer to further enhance interactions with them. Essentially, there needs to be a paradigm shift in the way businesses use data to inform their decisions. Disruption may not always be the most ideal or cost-effective approach, even though it is the current 'buzzword'. Moreover, many businesses lose their way because they see data and analytics as an IT function, as opposed to a business function that requires IT input and support. Once data is viewed as a tool that can inform all decision making in a business, rather than being confined to a single business function, a business has a greater chance of success. At the core of it all though is that business thinking needs to start moving away from using data to innovate purely through disruption. In most cases, the most effective way to innovate is to use data to understand what is currently not working, and then to focus initially on simply optimising to improve efficiencies. Technology certainly has disrupted the taxi and car hire sectors, and the insurance industry is by no means immune. We're hearing more and more about insurance cover at the click of a button, robo-advisors and the disintermediation of brokers, so if you're in fintech or the digital sector, how do you spot potential opportunities? For financial service providers, there are two major changes that will impact the regulations they operate under, and their revenue models. They're called the RDR, or the Retail Distribution Review, which essentially boils down to how financial advisors charge clients for their advice, and the Twin Peaks model. The latter introduces a new prudential regulator located in the South African Reserve Bank (SARB) and is intended to ensure that consumers are offered more protection. As part of this Twin peaks model, the Financial Services Board has been transformed into a dedicated market conduct regulator called the Financial Sector Conduct Authority. There's also the Protection of Personal Information Act, or POPI, which regulates how client and customer data is managed. It's going to impact collection, storage, and sharing of data that any business holds, and will most certainly impact current marketing and company database practices. Businesses will have one year within which to comply from the date when the operational sections of the Act are proclaimed by the President in the Government Gazette. And finally, Treating Customers Fairly, or TCF, a consumer protection policy that aims to ensure all financial institutions adhere to required customer treatment standards. The increase in frequency and severity of extreme weather conditions, coupled with intensifying natural catastrophes, will impact the costs of insurance for the average consumer or business, and the bottom line for insurance providers. Predictions are that increasing losses and insurance costs will lead to more stringent underwriting on the part of insurers, and the need for more proactive risk management measures. The race is on to develop new products that are better aligned to our modern lifestyles, and experts predict we'll not only see changes to the way in which insurance is sold, but also to the types of insurance. "For example, as South Africa increasingly becomes a litigious country, more liability-based products like Social Media Liability cover are being introduced to the market," says Maupa. Traditional financial services players are under threat from start-up disrupters who focus intensely on technology and data analytics tools to run their businesses. If businesses don't embrace these new tools they could be left behind. South Africa's SMME sector has for several years felt burdened by red tape and regulatory requirements. In his 2018 State of the Nation Address, President Cyril Ramaphosa undertook to "reduce the regulatory barriers for small businesses" - but it cannot happen overnight, and it certainly won't remove the very real possibility that you could, due to non-compliance as an SMME, find yourself in need of legal advice should the need arise, either as the aggrieved or charged party. If you do run a micro or smaller business you may well have short-term insurance cover for the vehicles and equipment you and your staff use, but legal insurance for civil, labour and criminal matters may not have occurred to you. Nevertheless, whether you employ one or fifty-one employees, you are not immune to actions for unfair dismissal or retrenchment, unfair labour practice, or non-compliance with other regulations. It's not in the comfort-zone of the first-time business owner, nor is having a lawyer or labour law expert a practical option for most SMMEs whose focus must and should always remain on maintaining cash flow and growing revenues and margins. Bad debt levels are also inclined to rise in the kind of business climate South Africa has found itself in more recently, and these could threaten to send you into an ever-spiraling vortex of reliance on credit that can often be avoided. That's why legal cover for an SMME is a prudent choice. There is a legal plan specially designed to cater for smaller or medium-sized businesses who simply don't have the budgets to manage attorney fees that can start at around R3000 per hour. South African law can be divided into three broad categories - Labour, Civil and Criminal matters - and the FNB Law on Call Business Plan now offers one of the most comprehensive legal packages that cover a range of eventualities across all three categories. The Plan also offers guidance about how to comply with the regulatory requirements that govern different types of registered entities, and can assist with debt collections procedures and recoveries. With the Law on Call Business Plan, business owners can rest assured that they will not have to spend thousands on drafting of contracts as the Plan offers drafting of up to 50 legal contracts per year. The policy provides you access to professional and commercial lawyers, with legal expenses cover between R150 000 and R500 000 per matter. You can also get a face-to-face consultation for any legal matter that is not covered under the policy. Marketing is not just about huge billboard, print, radio, TV and digital advertising - it also extends to other sometimes very simple tactics that collectively can influence perceptions about your small neighbourhood-based business. Basil O'Hagan, author of the book, 415 Action Packed Neighbourhood Marketing Tips, shares some of his thoughts with us. You should use any appropriate opportunity to inform local residents and the community about your sponsorship - ask to write a small notification piece or take out a small advert in, for example, school newsletters. Local signage can also be an effective way to let people know that you're sponsoring a local initiative or sports team. As members of a community, there's a social responsibility to contribute where we can. If it cannot be done in cash, it can be done in kind, so in the case of, for example, a catering establishment or coffee shop, donating surplus produce or untouched leftovers might be a great starting point. Some small businesses make donations based on a percentage of turnover over a particular period, others use their premises to host an event dedicated to a particular cause. It's a way to increase traffic to a local store, and it helps shine a spotlight not only on the cause, but also on your business' support of that cause. Browse the internet to find local community, charity and not-for-profit business associations in your area. A good way to link up with these organisations (and to make members aware of your existence) is to offer them discounts, or to pledge a percentage of each sale to their organisation or association. Investigate the possibility of investing in some form of outdoor branding that can raise awareness of your business. This could be a branded gazebo, a branded car, or perhaps even a kiosk. These allow you to have a presence at local neighbourhood events. This kind of promotion is suited to restaurants, coffee shops, petrol-station convenience stores and similar places. A common approach is to offer free, bottomless cups of coffee to police, nurses, paramedics and the like - it's a goodwill gesture that can establish your premises as a core part of the local community; and it can also give customers a greater sense of security at your premises. We often mention that we live in the digital age, where information flows at faster speeds, is more complex and is more accessible. As much as this information can be analysed by businesses to make better informed decisions, the real question is, is there room to alter the sales landscape? South Africa has roughly 52% of the population that use the internet, with 70% mobile penetration. With more than half the population being enabled to use either the internet or a cell phone, businesses need to ask themselves whether digital retail strategies are the next evolution of selling. A simple, yet startling fact by GSMA is that in 2015, mobile technologies and services were already generating 6.7% of Africa's GDP, amounting to $150bn of economic value and supporting 3.8m jobs. As more consumer groups become digitally savvy, businesses need to shift both their approach and "shops" from being traditional to being digital. According to a 2016 e-commerce report, South Africans frequently return to their online store, purchasing media, books or travel products. They are primarily based in metropolitan areas, visit social media sites (or check emails) while shopping and are quite at ease with technology. These types of insights and analytics in the digital space are growing significantly to assist businesses target consumers via social media - recall those banner ads you see when visiting Google or Facebook. Around 37% of businesses are currently using social media or viral marketing as their primary marketing driver, however this number needs to grow over the next few years. With 72% of reported online shoppers using price comparison sites, businesses cannot afford to not price their digital store products competitively. Further, around 60% of customers prefer to pay via credit card services rather than on delivery, implying that customers want convenience when completing their shopping. By also shopping online, you allow customers to view reviews of your product, which can help boost your sales through indirect marketing. What companies must understand about using online platforms to do business is that a firm can use digital platforms to either promote their brand or as a virtual shop. These two approaches are inherently different, with brand promotion being the more rewarding approach - Brand promotion is rewarding simply because many South Africans are on social media sites throughout the day. By increasing brand awareness, you are able to drive customers to your store in a more cost effective manner compared to traditional advertising. When promotions are then paired with offering the convenience of shopping online, enabling a high level of customisation or personalisation of your products and even delivery of your products, you enhance the customer's experience leading to loyalty and a much higher lifetime value. What this then establishes as a first point of call is that businesses need to assess the feasibility of branding and/or selling in the digital space - many businesses tend to focus on the creation of a virtual store, without promoting the business itself. The branding argument is much simpler to make - it is more cost effective and can reach a wider and more diversified audience. To sell online requires the business to evaluate whether their products are suitable for online selling - products that rely heavily on tactile sensation (touch and feel) are not ideal if the customer is viewing them on a screen. Once feasibility is established, you can then proceed to create an online catalogue along with payment mechanisms - elements of which are available from banks. The advocacy here is not to imply that traditional stores are not suitable, but rather that businesses need to understand whether their products can be seen as more attractive to their customer, if their customer are digitally savvy - taking the product to the customer in a manner that is attractive to them. The digital revolution is beginning to make real headway in how work is done in corporate South Africa. The current trends suggest that 2018 will start to see policy catch up, regulations fall into place, and in essence, countries such as South Africa will start to come to terms with the rise of the 4th industrial revolution. "2018 rotates around strategic action - being aware of your surroundings yet narrowly focused on doing what you need to do. I also expect 'digital' to be the new 'analytics' - the capability of businesses to harness data in a customer-centric way will be the key to thriving this year," says Dr. Yudhvir Seetharam, Head of Analytics, Insight and Research at FNB Business. Regulating the rise of alternative currencies - With the rise of cryptocurrencies, many countries have had to start working on ways in which to regulate them. In many cases regulators have been slow to react in publishing a framework for managing this digital revolution. The South African Reserve Bank (SARB) has started investigating a number of regulations with the view of creating a framework to govern cryptocurrency. Governance here is crucial to ensure mainstream adoption, which could ultimately benefit the financial system. Implementation of POPI - 2018 will see the impending implementation of POPI - where personal information protection becomes a priority. In 2017, we saw large scale data security breaches, which hurt the confidence consumer's place in the digital competency of businesses. Businesses, especially those that rely on data, need to be aware that security and protection of personal information is paramount. Further, usage of this data needs to be justified in advance. Purchasing contact information to cold-call customers is a good example of the misuse of data; and a violation of the POPI act for both the buyer and seller. Cashless environment - Along with cryptocurrencies, consumers are moving towards a cashless environment. We are most inclined to pay for what we buy digitally as opposed to cash these days. We've seen an increase in this trend as these payment solutions are often coupled with banking apps. It's often easier and more convenient to pay using your smart phone or via a card swipe that does not require pin authentication. Improved competition - Competition is also heating up, with fees and value propositions being at the forefront of the customer's mind. Businesses and customers want value for their money and ideally this comes in the form of lower fees (or an increased perception of value). With many new start-ups in the banking space, we are likely to see more competition on rates and fees - all being driven by a digitally offered value proposition. The 4th Industrial revolution - Last, businesses of all sizes are moving towards the "4th industrial revolution" - where automation in the form of robotics underpins higher efficiency and lower costs. Software vendors offer many of these solutions which can assist your business in producing more for less. "At the end of it all, the use of data and analytics is becoming more prevalent in running a business than we previously thought possible. Data-driven decision making is required for companies to succeed in a time where volatility and uncertainty run high. Going digital is not just about keeping up with the Joneses, but about keeping up with the times," concludes Seetharam. VAT rate raised by 1 percentage point to 15%. R36bn in tax increases and R26.4bn expenditure cuts in 18/19. Should be enough to delay a Moody's downgrade, but action on structural reform needed before midyear reviews to stave off a downgrade completely. The economic environment has improved markedly since the 2017 MTBPS, largely on the back of accelerating global growth and an improvement in local sentiment. The better domestic backdrop was highlighted by Treasury's slight upward revision to their 2018 household consumption forecast (1.7% from 1.2% in the MTBPS) and a much larger 1.4 pps increase in their gross fxed capital formation expectation. These two drivers saw the GDP growth forecast lift from 1.1% to 1.5% this year, rising to 2.1% in 2020 (Table 1). The increase in VAT necessitated a modest upward revision to the infation forecast (5.3% this year). Tax increases worth R36bn were proposed in the 2018/19 budget speech. The bulk (84%) of the revenue will come from a higher VAT rate and limited fscal drag. The value added tax rate (VAT) was raised by 1 percentage point to 15% which adds R28.7bn to revenue. Treasury acknowledged that raising personal income tax rates further would have negative consequences for growth, and instead opted to provide limited relief for fscal drag (income categories not adjusted for infation) which will add R6.8bn. R6.3bn relief was apportioned to tax payers earning less than R750,000 per annum. Medical aid tax credit refunds will also be adjusted by less than infation and is expected to net R700m for the fscus. An increase in estate duty from 20% to 25% for estates worth R30m or more will add only R150m, but a 52c/l increase in the general fuel levy, higher excise duties on alcohol and tobacco, as well as the introduction of the sugar tax (health promotion levy) will add a combined R4.5bn. An increase in the ad valorem excise duty from 25% to 30% will be imposed on motor vehicles, which could blunt some of the recovery expected in new vehicle sales. The scale of the tax increases are likely to be growth and infation negative, but we expect some of the pressure to be offset by more accommodative monetary policy over the short to medium term. Over the medium, expenditure is expected to grow by 7.6% to R1.94 trillion in FY20/21. The budget once again did not do much to address the expanding public sector wage will. The wage bill is still expected to grow by 7.3% over the medium term. The budget notes that additional measure may be required should the outcome of the pending wage negotiations not reach a sustainable agreement. Expenditure has been reduced by R85.7bn over the medium term - the government aims to achieve this by reducing spending on capital transfers by R39.7bn, goods and services by R16.5bn and currents transfers by R27.4bn. National treasury recognizes the reductions will shift the composition of spending away from capital and towards consumption expenditure. This in our view is not sustainable in the long-term (Figure 2). The expenditure ceiling has been lowered marginally over the medium-term; it nonetheless, expects a R2.9bn breach in FY2017/18 due to the recapitalization of SAA and SAPO. The biggest risk to the fiscal outlook are uncertainty around the growth forecast, the contingent liabilities of state owned entities and the public sector wage bill. Disclaimer: The information in this publication is derived from sources which are regarded as accurate and reliable, is of a general nature only, does not constitute advice and may not be applicable to all circumstances. Detailed advice should be obtained in individual cases. No responsibility for any error, omission or loss sustained by any person acting or refraining from acting as a result of this publication is accepted by FirstRand Group Limited and / or the authors of the material. It's the festive season - but also for burglars! Don't let your business premises become a target over the December holiday period. Statistics show that business burglaries during this time of the year increase exponentially, especially in empty offices and buildings. Taking out business insurance can certainly help small businesses recoup financial losses incurred from theft or burglary, but the inconvenience and potential impact on operations pose a serious threat that financial compensation cannot always make up for. Festive season losses are quite large and happen over a relatively short period. Taking precautions requires a twopronged approach. Firstly, you need to make sure you have appropriate business insurance cover, which means insuring all valuable assets and understanding the replacement values of those assets. It's a good idea to contact your broker and make sure all monetary values for your business assets are up-to-date. Business interruption cover is something that all businesses should consider, but it can be very technical and business owners should contact a trusted broker to discuss the most appropriate option. Switch off appliances. Turn off lights, servers and appliances that do not need to be operational during the festive season. Not only will you avoid accidental fres, but you will also save on your business' utility bill. Conduct a thorough inspection for potential fre hazards. Make sure you dispose of newspapers and store all fammable material away safely. Lock all valuables: Burglars will target computers, laptops, devices and stock. These items should ideally be placed in a secure room or safe, and should not be left lying on desks or in the line of sight. Activate alarm systems: Test your alarm systems and make sure they work properly. It's always a good idea to activate new and stronger passwords and alarm codes from time-to-time. Alert your alarm company of the period over which your business will be closed, and supply them with at least two emergency contact people. Burglar bars: Secure burglar bars and place them on the inside of any windows, this acts as a deterrent and can slow burglars down. Make sure your surveillance cameras are working, if you have them. Signs warning of the presence of CCTV cameras can deter crime, so place them in plain sight. Keep records of all movable assets: Take an inventory of computers, stock, keys, and gate remotes. Also, list all serial numbers for equipment - this helps to speed up the insurance claim process in the event of theft. Safeguard essential documents and information: Ensure that the documents that are essential to your business, such as loan agreements, insurance policies, business contracts, shareholders agreements and most importantly, documents containing client details, are safely stored away and backed up. Where you have client details in electronic format, it is essential to ensure that this is safely stored. To make sure that your business assets are adequately covered or for any questions, contact one of our FNB Insurance Brokers ( fnbibsales@fnb.co.za ) and quote Business Insurance as a reference. Running and growing a business is not always easy, especially in these tough economic times. Business owners need to keep their existing clients happy, manage their staff and attend to all administrative, marketing, financial and accounting needs. They also need to constantly adapt their product and service offerings to stay relevant (more so now than ever before) and of course they need to carefully manage costs to ensure maximum profitability. One area that small business owners often fnd challenging is growing their business and attracting new clients. This is understandable as there are only so many hours in a day, and these hard-working individuals have much to do in running their business. Marketing your business can be done very smartly nowadays, largely due to the growth of digital marketing platforms such as websites and social media networks, and having the know-how to use these platforms in conjunction with conventional methods such as print, fyers and brochures, and face-to-face meetings with prospective clients. Online advertising across premium websites or through advertising networks like Google Display Network has become a must-have part of the marketing mix, but there are also other ways of tapping in to the power of online advertising. FNB understands all of this and recognises that it can be very hard and often expensive to grow your business. With this in mind FNB has developed the FNB Business Directory, a portal that can expose your business and its products and/or services to the entire FNB banking customer base. The Business Directory lists and displays the information of participating FNB businesses and can be viewed on www.fnb.co.za and on the FNB App. Your business's details are displayed in Google map view making your business easy to find. Additional functionality includes the ability to upload a company logo as well as digital versions of documents such as product lists, catalogues and menus. For more info on the Business Directory or to register,email businessdirectory@fnb.co.za and quote BTBD as a reference or call 087 730 5790 . FNB is well positioned as a leading business banking franchise. We continue to focus on understanding the needs of entrepreneurs - something we call "businessism" - basically understanding the challenges that businesses have, and trying to help solve for this. FNB has made great strides in increasing access to digital banking offerings enabling young businesses; facilitating quicker and effcient access to credit and fostering inclusivity in lending activities, ultimately supporting the development of the SME ecosystem. FNB will continue to seek partnerships to access alternate funding sources, risk sharing relationships and business development support platforms. An example of this is the additional funding FNB has accessed from the IFC for deployment into the SME sector. A progressively deeper engagement could stimulate opportunities for FNB to play a leadership role in currently under-banked and underserved markets. Our commitment to empowering SMEs includes helping businesses navigate the legislative and regulatory requirements in setting up a business, which we facilitate through FNB's CIPC business registration partnership, as well as Instant BEE certifcation offering. FNB Business Instant Solutions includes a suite of offerings including an accounting system, which also affords payroll administration, invoicing functionality, cash management and budgeting. This offering is provided free of charge to the entrepreneur. These offerings are making a signifcant difference, with 185,000 businesses availing of Instant Solutions and more than 3,000 CIPC applications being facilitated monthly. Our ongoing contribution to the national agenda remains a priority to us and we are excited about the opportunities and latent value we believe our strategy will unlock. Legend has it that a young boxer and entertainer had a conversation with an old Australian miner in Kimberley, South Africa, in the 1870's. The young man learned that Kimberley's volcanic pipes were made from two types of rock. The top layer was yellow and easy to mine, while the blue rock underneath was harder to mine, but had a far higher diamond yield. The young boxer bought as many concessions as he could from miners selling when they hit blue rock. Twenty years later, Barney Barnato would become one of the richest men in South Africa's history. Like young Barney Barnato, we are nowadays faced with yellow and blue rock decisions each day - some could help us become wealthy. It all boils down to our knowledge of the trends, timing and having the capital to invest. Aside from cryptocurrencies, there are other forms of non-physical digital currency that demonstrate our pursuit of a cashless society. In East Africa, M-Pesa is a good example - it's gained traction by enabling money transfer using cellphones. M-Pesa did not succeed in South Africa, in part due to the success of competitors like FNB's eWallet. With an eWallet you can get cash from any FNB ATM or selected retailers for up to R5,000 a day without opening a bank account. A recent cashless trend is where a physical card number is converted to a digital token, further securing sensitive card information. You can then use the token to make payments in apps such as Google, Apple Pay and FNB's Banking App. Cashless has now moved virtual, and a virtual currency is issued and usually controlled by its developers. It can be used and accepted by members of a virtual community. Bitcoin users are issued with a bitcoin address called a public key, and the Bitcoin is issued with a private key. This key is the 'password' that allows an individual to spend his or her bitcoins, and they can keep their bitcoins in a digital wallet or vault. Like the diamond and gold rushes of old, Bitcoin also has miners. Instead of shovels they use graphics cards and computers, and they literally sell computer processing power in return for payment in fractions of the cryptocurrency. The fraction is pre-set in the crypto's algorithm and can be seen as an inflation rate that is kept steady in the same way gold is mined at a relatively steady rate hence maintaining its value. Simply put, the miners validate a transaction and its price, and put this information into a data block. The speed at which they are first to put a valid block into the chain is called the hash rate, and the faster the miner's hash rate, the more cryptocurrency they earn. Cryptocurrency FinTech is disrupting the traditional notions of a central bank controlling physical money flows and it is raising interesting debates about legal status, money supply, exchange controls, and tax reporting requirements. Japan and South Korea have already approved Bitcoin as a legal tender, with Russia and India braced to follow. In other countries, like South Africa, to withdraw Bitcoin you have to transfer your Bitcoin back to your local currency bank account. You can, however, use Bitcoin to buy at a number of online retailers such as Takealot and Bidorbuy. These Fintech 'rushes' are the more valuable to learn - they may be more complicated than the mining of old, but their supporters argue it's far less labour-intensive than digging in a deep hole in Kimberley. Ensure that the savings or investment account gives you a return that curbs the effects of inflation. If you are uncertain of future cash flow needs, then an account such as the FNB 48 Hour Cash Accelerator will balance the need to have quick access to savings, without compromising on healthy growth. "The solution is developed with the specific cash flow and growth needs of businesses in mind and, as such, it combines a very competitive interest rate with an appealing 48- hour notice period to access cash invested, coupled with the assurance that the capital and quoted returns are fully guaranteed," says Jacobs. Monique Van Niekerk runs a business called Gauteng Metal Recyclers. She has seen the company grow from two to thirty six employees since 2006. Much of this growth took place when she joined as financial manager, which lead to her fnally taking over the helm and buying the company in 2014. Smart financial management and using cash management solutions and services has helped the business through some tough times, "from one vehicle to a small feet of nine skip trucks, bakkies, other vehicles & machinery." The company focuses on processing and recycling scrap metals, and runs a network of skip bins dotted around various locations, as well as relying on collecting metal from suppliers, some of whom are small vendors who bring in scrap metal from off the streets. Monique pays these suppliers in cash, which for many years meant holding fairly large quantities of notes on her premises. Following an armed robbery, the business explored alternatives that would be safer and more cost efficient. Monique started using FNB's eWallet Pro, which enabled the digital transfer of money to vendors, and the purchase of scrap metal from smaller suppliers who have no formal bank account - their payments can be made to cellphones or reloadable eWallet Pro cards. eWallet Pro is a solution that is available to all FNB customers who have access to its Online Banking Enterprise platform. It enables businesses to make payments without the risk and cost associated with handling cash. Many FNB customers use eWallet Pro to pay wages to staff who have no bank accounts, issue eWallet Pro cards for allowances and even petty cash. For more information please contact the eWallet Pro team at SaleseWalletPro@fnb.co.za and quote BTWP as a reference. Every entrepreneur has heard the adage "cash fow is king", and they know that effective cash fow management is essential for business survival. For your business to stay on route, it requires a strategy for dayto-day management as well as razor sharp focus on the specifc financial areas of your business. This is especially true in tough economic times when external factors out of your control will impact your business. Through understanding a business' working capital cycle, it will assist an entrepreneur in identifying those specifc areas of the business to focus on. If you can reduce the number of days it takes to collect money from your debtors, or stretch the terms you get from creditors when the pressure is on, you automatically enhance your business' cash fow. There probably isn't a business that isn't considering how to reduce costs as it navigates its way through the frst few months of a technical recession and South Africa's credit ratings downgrades. One area to explore is how you handle cash payments. Instead of carrying cash on your premises or issuing countless cheques, or paying staff who have no bank account in cash, consider using a digital payment solution - more commonly referred to nowadays as a mobile or digital wallet payment. FNB offers companies a digital payment solution called eWallet Pro, through its Online Banking EnterpriseTM platform, allowing affordable payments to anyone, without their need for a bank account. Withdrawing of cash and issuing of cheques cost businesses at least R570 and R950 respectively for just 10 people, while eWallet Pro will only cost R110! These kinds of solutions are gaining in popularity and are particularly relevant in our African context, where large numbers of the workforce are not necessarily formally banked. It's not only a practical solution, but it can also save on costs that can rapidly multiply and add up to signifcant charges. There are a number of options - so you can choose to pay anyone with a valid South African cellphone number by 'transferring' a payment directly to their cellphone, or you can issue them with a reloadable eWallet Pro VISA card, and simply load the amount due to them onto the card using the bank's Online Banking Enterprise platform. There are three kinds of digitally reloadable cards; an eWallet Pro Generic card and Gift card, used for employee solutions such as salaries, wages, allowances or incentives and business solutions such as loan payouts, aggregator payouts or petty cash. There are also the Merchant Restricted cards, which are used by many companies, for example, the Medical Aid, Insurance and Retail sector, and you can choose to have the card co-branded with your company logo on it. The card holder uses the card at any pre-selected pre-approved outlet of your choosing. eWallet Pro removes the risks and costs associated with handling cash and cheques, and using eWallet Pro will make payments simpler, safer and more efficient. For more information on eWallet Pro go to www.fnb.co.za/eWalletPro or to be set up with eWallet Pro, please contact the eWallet Pro team at SaleseWalletPro@fnb.co.za and quote BTWP as a reference. The FNB Business Innovation Awards, supported by EndeavorSA, is a programme that aims to recognise true innovation excellence, whilst emphasising the importance of business scaleability - a significant driver of employment. Saryx Engineering Group (SEG) was announced as the winner of the 2018 FNB Business Innovation Awards (FNB BIA) on 7 June 2018. Founded by two female entrepreneurs, Ingrid Osborne and Julie Mathieson, Saryx offers an affordable hosted software service called HSEC Online, that digitises company safety and compliance. This helps companies of all sizes track document compliance (for company, people and equipment), share these documents securely, and provides a transparent, collaborative workflow platform to do so, accessible on any platform at any time. "Being chosen as a winner among the nine great businesses fundamentally affirms our business model. We have done some amazing work and continue to evolve while moving the needle in the industry using new innovate and technological tools," says Ingrid Osborne. "Winning this award is a step in the right direction to access global markets. We are very excited about the future and the opportunities that this accolade will afford our business," adds Julie Mathieson. FNB Business will sponsor Ingrid Osborne and Julie Mathieson to participate at the coveted two-day Endeavor International Selection Panel (ISP) in Argentina this year in September 2018. The ISP brings together high-impact entrepreneurs to present their business to world-leading business personalities for a chance to be part of an exclusive global network. Mike Vacy-Lyle, CEO of FNB Business says the FNB Business Innovation Awards is an incredible platform that showcases business excellence and the potential of South Africa's entrepreneurs. Since the launch of the awards in 2015, we have seen winners and finalists go on to become thought leaders and employment creators in their respective industries. This attests to the ability of the initiative to enable businesses with the highest potential to scale to access global markets. Congratulations to (SEG) for winning this prestigious award and to all the businesses that took part in this year's competition." "The FNB Business Innovation Awards is a celebration of the remarkable journeys of some of our country's entrepreneurial role models. These founders are committed to building successful local businesses that drive much needed economic growth and job creation," adds Catherine Townshend, Managing Director of Endeavor South Africa. "Congratulations to Ingrid Osborne and Julie Mathieson on a remarkable journey in founding and building the business to this point. Through Endeavor and the exposure at the ISP, we are confident that they will be even more motivated to think bigger and engage with a network of like-minded ambitious entrepreneurs that are driven to build a local business with a global footprint". What was the selection criteria this year? Leadership Potential: Leaders with the vision, energy and skills to take their business (and themselves) to the next level. Commitment: Entrepreneur must be willing to participate in a high-impact, detailed programme. Ecosystem Impact: Will become role models by giving back (both financially and non-financially) to the broader entrepreneurial ecosystem. Turnover: Business must have a minimum annual turnover of R10-million. Scale and acceleration: The business is scalable, in other words it has the potential to grow and become a market leader. Unique Business: It cannot easily be replicated. Inflection Point: Business at a key inflection point in growth trajectory. Factors such as brand and reputation, stakeholder relations and goodwill, environmental sustainability, social responsibility and quality of governance were all taken into consideration during the process of selecting the winner. For a comprehensive list of the finalists, judges, and background on the competition, please visit www.fnbbusinessinnovationawards.co.za. It has been a much-debated topic and continues to be so. However, the first step towards a 'blanket' national minimum wage has been taken. For now, the category of worker who will benefit from the National Minimum Wage Bill is every worker not classified as an agricultural worker, farm worker, domestic worker or expanded public works programme worker. These categories are still governed by what are called "sectoral determinations". The sectoral determinations work on cycles of a few years at a time and will also be subject to review over the coming years. Compliance for all workers not governed by sectoral determinations will require a minimum wage of R3500 a month, or R20 an hour. The National Minimum Wage Bill also establishes a national minimum wage commission, whose task it will be to review the national minimum wage every year. The intention is that this body will ultimately also take responsibility for the current commission that advises the minister on sectoral determinations - this will happen once sectoral determination wage minimums are phased out. The sectoral determinations that fall outside of the parameters of the National Minimum Wage Bill include farming and agriculture, where the minimum wage is currently set at R18 per hour. Domestic workers are entitled to a minimum wage of R15 per hour, while expanded public works programme workers are guaranteed a minimum wage of R11 per hour. It is important to note that these minimum wages should be calculated to exclude any amounts paid to cover extras such as transport, equipment, tools, food or accommodation allowances, or any gratuities such as bonuses, tips or gifts. Provision is made for an employer or an employers' organization (registered in terms of section 96 of the Labour Relations Act or any other law), acting on behalf of its members, to apply for an exemption from paying the national minimum wage. Please be aware, however, that settling on your own definition of the type of worker you employ does not guarantee compliance. You may inadvertently be breaking the law, so you do need to check the definitions for different types of workers in the Basic Conditions of Employment Act, and make sure that you are not governed by one of the sectoral determinations. You should also check the definitions pertaining to hours of work and, more specifically, the definition of 'ordinary hours'. You will also be required to keep records of payments (to be used in the event of a dispute or inspection). Running into cash flow problems because debtors aren't paying their bills can be the single most cited reason for many businesses closing their doors. It's not about reflecting the growing revenue, but rather an ability to collect the revenue timeously that is the challenge, but there are formal financial solutions to the problem, so it's worth educating yourself about some of the options available. If you're the kind of business that has to invest in carrying stock, or you're finding your debtors falling foul of paying you on time, Invoice Discounting (where you can use your unpaid Accounts Receivable as collateral for a facility) is worth exploring, and now it comes with more flexibility than some of the more traditional Debtor Finance facilities. Debtor Finance Lite also reduces the admin related to standard Invoice Discounting - you submit financial information and the limits remain static for a month at a time, which gives you certainty in planning your cash flow. After a slow start to the 2018/19 summer crop season with severe dryness during December 2018 in the growing areas particularly in parts of the North West and the Free State, conditions rebounded early in January 2019 as good rains provided the much-needed moisture for planting. Farmers proceeded to plant and although some have reportedly planted beyond the planting window in the west which put them at risk of frost damage. The latest National Crop Estimates Committee (CEC) report indicates that farmers have planted 2.27 million ha of maize this season, which is slightly down by 2.2% year-on-year (y/y). Of the three major producing provinces, the biggest decline is in the Free State (FS) with a 5% drop in planted area. Surprisingly, the North West (NW), which accounts for 21% of the total country area under maize, has surprisingly raised its area planted by 1% year-on-year (y/y) to 487,000 ha. Both the FS and the NW experienced severe dryness during December 2018 which raised fears of a significant drop in output for the 2019/18 production season. As expected, the Mpumalanga (MP) planted area estimate came in 2% higher y/y mainly due to a 7% increase in white maize area. Yellow maize area for MP is up 1% y/y and still accounts for the biggest share (70%) maize area in MP. Oilseed crops were however the biggest losers with soybeans and sunflower area falling by 5.5% y/y and 26% y/y respectively at 444,00 ha and 743,600 ha. While the drop in maize area was expected given the bad conditions towards mid-season, the figures were much better than earlier market expectations. This might bring a total crop of closer to 12 million tons of maize, enough to meet the country's annual consumption if conditions improve further in the near term. Considering the huge carryover maize stocks of 3.2 million tons, supplies will remain adequate for the year ahead. The implications are for a further limited upside for grain prices and positive for inflation outcomes in the months ahead. The short to medium term weather outlook still calls for rains across the producing areas which bodes well for the developing crops and a good finish to the 2018/19 summer crop season. FNB is hosting the 7th Franchise Leadership Summit at Montecasino on Tuesday, 13 November 2018. The summit is a well-attended industry discussion amongst high calibre franchisors and industry stakeholders. The Summit is aptly themed "Equipping you to future proof your franchise". The discussions will include exploring the impact of technology on the franchising industry. To this end, Morne Cronje, Head of Franchising at FNB Business explains that "the rise in online applications in franchising means we need to find innovative ways on how to continue to grow and improve this new dimension to this already robust industry." The South African Fast Food Landscape Report of 2018 backs the position that Cronje speaks to as it revealed that a growing number of consumers are opting for the convenience of online delivery services when purchasing fast food, this has a far-reaching impact that the Summit will begin to talk to in this year's leg. The state of the economy and what it means for entrepreneurs. Beware of the Fox, a look at the actual impact of Artificial Intelligence (AI) on business. Will E-commerce replace traditional retail? - How to adapt your business model. Pivoting your skills for the second wave of disruption. Check ins and check outs - how franchises can use social media to build their businesses. Social Franchising - Is this the future for Healthcare? Cronje says the great line-up of industry experts will go beyond the digital discussion and the subsequent challenges it presents, each speaker will offer workable solutions on how to improve and navigate the move to the 4th Industrial Revolution as a business. Franchising is a healthy and resilient industry in South Africa. However, we need to continuously improve it and keep adapting to the ever-changing landscape. Therefore, unpacking online applications and trends in franchising is at the centre of this summit amongst other things. As a specialised business unit, FNB franchising provides the know-how when dealing with franchisors, franchisees and other franchising industry stakeholders. FNB Franchising provides innovative, tailor-made financing solutions that are designed to provide franchisors and franchisees with the necessary financial and operational tools that can help accelerate and support the growth of their business. Never trust a revolution - (Terry Pratchett). Unless you have chosen to live off the grid, I am sure you can feel we are in the 4th industrial revolution and that the business world is changing. It's an uncertain time and very hard for us to trust that all will be fine if we just keep doing what we have always done. This article is not about what will be the next big technology, that has proven way too hard to predict, but rather what are the new ways of working that will help ride the wave of change from this revolution. Your mind and body are perfectly designed to live on the African Savannah about 100,000 years ago. According to anthropologist Robin Dunbar we only have the mental capacity and time to manage around 150 primary or 'I care, you care' relationships at any one time. If they are not primary relationships, they are impersonal, secondary relationships that are based on formal rules. You may belong to many organisations, and the bigger the organisation's size the more likely you have a secondary relationship with other parties. You might not have been the one that set these formal rules (i.e. an employment contract) which may leave you suspicious on who exactly benefits from these rules. This leads to a power struggle in impersonal relationships rather than the social cohesion of the strong primary relationships. The last 60 years has seen a number of theories evolve on what motivates people, from hierarchies of needs to behaviour being driven by reinforcements and punishments. New motivation theories have taken human motivation further. According to the psychologist Frederick Herzberg, people are motivated by what he calls the hygiene factors (pay, work conditions, rules etc.) but this is only to a point. As Dan Pink states, 'pay people enough to take pay off the table'. Not that easy in a low growth emerging economy, but his findings showed that increasing pay only works as a motivator for people doing a mechanical, single answer tasks. In the 4th Industrial Revolution jobs are going to require more thinking and creativity, where increasing pay based on output actually reduces performance. Pink found that what really makes people satisfied at work for the long term is being able to determine their own path, the urge to get better skilled and the desire that one's role is meaningful or has a higher purpose. Most people don't just want to chase profits, they want to contribute to society too by belonging to a what Peter Senge calls a 'learning organisation'. A group of people working together, to collectively improve their skills to create results they really care about. Humans have glitches, understand and compensate! The Nobel Prize for Economics in 2017 was given to Richard Thaler for uncovering that the economy surprisingly was made up of humans (his own words). We are not rational beings trying to make the best decisions with limited resources. We constantly make poor decisions based on emotion and bias. All have laughed at that relative or friend that makes a strange decision about their money or health, but what we don't realise is that some of these decisions are caused by the persons attitudes and feelings whether they are aware of these thoughts or not. The 4th Industrial Revolution rewards innovative and disruptive thinking, while our human bias on a whole (with the exception of Elon Musk) is pushing you to de-risk and keep within the safety of your comfort zone. Being overly cautious is definitely not as helpful now as it was to our ancestors surviving on the savannah all those years ago. We have an optimism bias - we believe we are less likely than everyone else of suffering a negative event. This bias causes us humans to grossly overestimate what we can do and underestimate the time it will take. This is what Daniel Kahneman (a friend of Richard Thaler's) calls the 'planning fallacy'. We start a big project, we stop looking at what competitors are doing, we believe our work is better than everyone else's and eventually we get ourselves in a situation where we just have to finish the project because we have sunk so much into it (called the loss-aversion bias). This does sound negative but rather than not starting new projects, the 'new way' is to do things better. A clever group of people generated 'The Agile Manifesto' for this reason. Valuing people above process, collaborate rather than negotiate, get something working rather than a concept in a big pack of documents and be able to change rather than religiously follow a plan. Agile has a few tricks or ceremonies, like scrum's (should be popular with South Africans). A scrum is generally where people stand-up and say what they did yesterday and what they will do today. This allows the team to inspect progress and self-organise their workloads to meet their goals. There is an angle here of healthy competition and confidence built through transparency. It is important to find any issues early, to only provide what is needed by the customer and to realise you always have to be willing to change. Another human bias is that we favour what is known over the unknown. We don't enjoy ambiguity, and for us the easier it is to see the goal, the closer it seems and the more we are motivated we are to finish it. Ever wondered why people complete a task in the last minute, turns out we just can't visualise finishing big complex tasks as we need these tasks broken into small manageable steps. This is also a big tenant of both Agile and a 'new way' called Lean. The recommendation is to make sure each step can be seen (sometimes on big boards), make sure people are rewarded for reaching each step and most importantly ensure that each goal adds value to ultimate customer. The last point is a key tenant of 'Lean' manufacturing but its applicable to all industries. The best people to tell you the value of a step are the people at the coalface, customers or customer facing. If a step or process does not add value to the customer you have to question why. If value is not being added then this is a waste. Removing waste from a system, ensuring a smooth flow of work without bottlenecks and continuous improvement is why Japan has the world's most profitable vehicle manufacturers. The 4th Industrial Revolution is starting and it will bring a time of massive change. The way we get ready for this time is to understand ourselves, what motivates us and our failings. By doing so we can get ourselves ready to succeed in this revolution and as Eric Ries states: 'The only way to win is to learn faster than anyone else'. Finance Minister Tito Mboweni began his budget speech by setting the scene in the context of renewal and growth - supported by specifics that are aimed at driving and encouraging business expansion. There were some clear moves to attract foreign investment, among them the relaxation of visa requirements to make it easier for tourists to visit and invest in South Africa. The income eligibility thresholds for the employment tax incentive scheme (ETI) have also gone up - enabling eligible employers to reduce the amount of employee's tax due to them from the ETI amount claimed. From 1 March 2019 employers will be entitled to claim the maximum value of R1 000 per month for each employee earning up to R4 500; this amount was R4 000 previously. The maximum monthly income earned by employees to qualify for the scheme has also increased from R6 000 to R6 500 per month. A total of 1.1 million jobs for young people are supported by this programme, which has now been extended for another 10 years. Government has also allocated R19.8bn for industrial business incentives; R600m of which has gone to the clothing and textile industry's competitiveness programme. It is expected that this will support 35 500 existing jobs and create about 25 000 new jobs over the next three years. The Jobs Fund was a further recipient of support. It has, to date, disbursed R4.6bn in grant funding and created some 200 000 jobs since its inception. The government set aside R9bn for the fund, which is intended to co-finance projects by public, private and non-governmental organisations that contribute to job creation. The minister announced that the allocation to the fund would rise to R1.1bn over the next three years. While there was once again an acknowledgement of the administrative burden on small business, no concrete changes have been made yet. However, R481.6m has been allocated to the Small Enterprise Development Agency (SEDA) to expand its small-business incubation programme. Failure to optimise cash flow remains the number one reason for start-ups shutting their doors within their first two years of operation. In order to increase your chances of sustainability, you need to focus not just on how much money you turnover as revenue, but also on how you are managing the inflows and outflows of that money. One of the most cited causes of cash flow problems is the time it can take for customers to pay their bills, and one of the simplest but often overlooked precautions is to review your business's payment terms. Issuing an invoice that reflects valid payment terms and conditions is not a legal or SARS requirement, but it is good practice and can go a long way towards helping you manage your cash flow. It's as simple as including a section labelled PAYMENT AND CANCELLATION TERMS on every invoice, where you can capture agreed terms and conditions, or, if you have not discussed terms, it affords you an opportunity to propose terms that you know suit your cash flow demands. In principle, the aim should be to match the time frames between when your business gets money in, and when it pays money out for overheads, expenses and supplier costs. If, for example, you pay weekly wages, you ideally need to have shorter payment terms in place with your customers. If you pay monthly salaries or have monthly stock and debt payments to honour, offering payment terms longer than 30 days can result in a gap between the time at which money is coming in, and the time at which your business is obliged to make payments out. ItÃ¢Â€Â™s good business practice to match these payment terms, or, even better, to ensure that client payment dates fall before cash outflow payment dates that apply to your vendors. You may want to consider negotiating a 45 to 60-day grace period with your vendors and suppliers. By collecting money before you're due to pay out money, you have a better chance of achieving what is called a positive "net cash flow" - the difference between the cash inflows and cash outflows during a specific period. It optimises how you're managing turnover and gives your business a better chance of surviving tough times, and can also leave you with reserves that you can invest. Vaughan David, CEO of Business Savings and Cash Investments at FNB suggests that "when you are in a positive net cash flow position, consider opening a separate savings account where you can transfer any extra cash, and earn interest on that cash. This cash reserve can then start to serve as a savings buffer for any future unforeseen expenses, or to keep money aside for planned expenses like provisional tax. Remember to check which fees are charged (if any) and the type of access you will have to those funds". All companies might be businesses, but not all businesses are, in the legal sense, companies. It's an important distinction, with several implications for business owners, implications that can affect how you optimise revenues and ensure longevity. The prospect of the administration involved when setting out to start a business can be a daunting one, but it's not simply the sheer volume of documentation required that matters. You should carefully consider the type of business you register, as it can have both cost, tax and legal implications down the line. Many small and service-oriented businesses choose to operate as sole proprietors; it's the simplest kind of business structure, and does not need to be registered. As an owner you would be the sole proprietor, and can trade under your own name, with no separation between personal and business assets and liabilities. This means that as a sole proprietor you benefit from all the profit and assets accumulated through the business, but you are also liable for any debt that the business incurs. A private company is its own legal entity that is separate to the owner. Therefore, by choosing to register a private company, you, as a business owner, take less risk than if you were trading in your own name as a sole proprietor. A registered company can also trade in the formal business sector and bid for government tenders. A private company is eligible for numerous tax benefits/deductions such as business expenses, auto expenses, medical aid, office space and lower income tax rates. Smaller private companies do not pay audit fees. Together with the savings that can be made through tax and VAT, private companies often end up being the cheapest and most suitable legal format for a business. Private companies can have several or even only one director, so decisions can be made quickly. There is also no need to publish financial accounts. If you decide to start a private company and not operate as a sole proprietor, you will need to register it at the Companies and Intellectual Properties Commission, commonly known as CIPC. First National Bank, in partnership with CIPC, provides a free facilitation service to register your company and get a business account in the same process. You will also receive a new business account Welcome Pack with FNB, enabling your company to begin trading immediately. For more info or to register, please click on "For My Business" above and then select "CIPC + BEE" or call 087 736 2247. One of the most commonly overlooked priorities when starting and running a business is taking out adequate short-term insurance cover to cater for unforeseen risks. Theunis Fourie, Head of Insurance Brokers at FNB, says business owners who overlook having adequate insurance in place could find themselves facing liquidation. There are numerous risks that need to be considered, so it's important not to assume that a 'one size fits all' policy necessarily covers all eventualities. Protection against the loss of profits - business interruption cover can be used to protect the business against the loss of income following an insured event and ensures business continuity To make sure that your business assets are adequately covered or for any enquiries, please contact one of our FNB Insurance Brokers at fnbibsales@fnb.co.za and quote Business Insurance as a reference. The end of February marked the end of yet another tax year (March 2018 - February 2019) for companies, trusts, close corporations and all individuals, but the end of one year also means it's time to prepare for the new tax year. If you accept that 'sustainability' is not just about revenue, then getting your tax affairs in order should be part and parcel of your annual planning and administrative preparations. To start getting your tax house in order, you will need to first determine the type of tax returns you will be required to file. This is dictated by the legal structure of your business, for example, sole proprietors report business income on a personal tax return or ITR12, whereas Close Corporations and Companies must complete an ITR14. Surveys conducted by accounting professionals throughout the years show that businesses often only remember to file tax returns or other required submissions, or apply for document renewals such as Tax Clearance Certificates, just before the deadline date, or, in some cases, after an expiry date. This places undue stress on the business and can cost you revenue if your line of work relies on tender and RFP submissions. It can, in some cases, also threaten sustainability. An example would be non-submission and payment of annual returns by companies as required by the Companies and Intellectual Property Commission (CIPC). Thousands of companies face potential deregistration each year because they are unaware that their 'annual return is due and payable in the month of incorporation each year'. Are you an employer? SARS expects all entities with employees to register for Employees Tax (PAYE, UIF, SDL) and to withhold and pay over collected tax not later than the 7th of the following month. FNB's free Instant Payroll system is a tool designed to help employers create payslips, calculate tax and provide relevant reports like the EMP201 and EMP501. SARS publishes tax types and due dates for each tax type on their website www.sars.gov.za . Your business may also be subject to other deadlines throughout the year; earmark those dates to avoid having to pay fines or interest penalties. The method you use to record and track your business transactions will determine how difficult it will be to prepare for tax season. Using manual systems or spreadsheets can cause confusion when it's time to reconcile accounts, so consider using online software with automated functionality, such as FNB's Instant Solutions, which is linked to your FNB business bank account. Without automation, you are likely to waste time calculating and reconciling spreadsheets and job cards. Each year SARS imposes penalties and interest on businesses for incorrect employees' taxes. Employees too, can bring lawsuits against your business if you have made mistakes in relation to their pay. Using manual methods to record information required for tax returns is risky. The penalties for incorrect information can have a serious and negative impact on your business. Whatever automated software you use, make sure that your business systems are integrated with it to provide accurate and ideally real-time information. Keeping accurate records of your financial operations will be invaluable in helping you prepare statements that inform and support your tax return. Your records need to confirm all income, expenses, assets and liabilities declared on your returns. You must be in a position to provide evidence to support all entries, deductions, and statements, and you need to keep these documents, including invoices and receipts, for a period of not less than five years. Surviving a tax season does not end after filing and making relevant payments - the information needs to be kept (in a safe place) and to be made available for inspection on request. SARS provides a list of documents and the length of time you are required to store such information for. Hard copy documents should ideally be stored electronically using document scanning apps. Scan documents monthly throughout the year to avoid any last-minute rush. For help in getting started with FNB's Instant Solutions Products, contact the Support Centre on 0860 22 22 55 / instantaccounting@fnb.co.za . The unfortunate news is that the fuel levy will increase by 30c/ litre for diesel from 1 April 2019, which with current under recovery in fuel prices add to the woes of producers. One positive however, is that the diesel rebate will increase to R 3.33/ litre for qualifying users. Users of this system needs to protect the integrity of the system in collaboration with SARS to ensure future support from government. The Minister's announcement of supporting private sector investments in agriculture by emerging farmers is most welcome. The allocation consists of R1.8 billion for the implementation of 262 priority land-reform projects over the next three years, and the R3.7 billion to assist emerging farmers seeking to acquire land to farm. On this point, the details of implementation are necessary as implementation has been a nightmare. This include a clear programme for the implementation of the blended finance model by the Landbank. The outbreak of the Foot and Mouth Disease (FMD) has elevated the importance of biosecurity and the allocation to beef up laboratories and development of vaccines is a positive step. In this regard it is positive that the Minister made R 456 million provision for the employment if newly graduated veterinarians within rural areas as part of their compulsory community service. There is however no clear mention of the current drought affect parts of the NW, FS, and NC and this is a missed opportunity. Overall, positive budget from the agriculture perspective but we need to closely watch implementation. Getting your business to the point where you're braced for growth can often require funding and while getting any form of credit is not something one should rush into, it may be needed if you're looking to expand your business and have a solid plan for how you believe additional financing can help you achieve this. There are several types of credit options offered by banks; from overdrafts and conventional business loans that may be secured or unsecured with a fixed or variable interest rate over a fixed or variable period, to credit cards and revolving loans. While some forms of credit are more suited to specific needs, each comes with terms and conditions that need to be carefully weighed up before taking up a credit facility. An FNB Business Overdraft: A Business Overdraft allows you to use more money than the available balance in your transactional account, up to an approved limit. You pay interest on the amount used until it's repaid, and you may have to pay fees for access to the facility and charges as well. The great feature of an FNB Business Overdraft is you only pay when you use it which allows you to have the safety of the facility without incurring interest. FNB Business Booster Loan: A Business Booster Loan is a new credit product that allows you to qualify for credit if you have minimum of 6 months' turnover. This allows businesses to access credit earlier in the business lifecycle and fixed monthly repayments over 6 months allows you to budget effectively. With loans varying from R10 000 to R100 000, you can get a loan that suits your business's needs. FNB Business Revolving Loan: An FNB Business Revolving Loan is an agreed credit limit that allows you access to credit once 15% of the original amount has been repaid. This is subject to you meeting specific credit criteria. You'll only pay interest on the amount used and monthly fees do apply. FNB Business Loan: An FNB Business Loan allows you access to credit over a set period which can extend up to 60 months. The longer repayment term allows you to reduce your repayment amount and as the loan amortises, you pay less interest over the period of the loan. It's a good idea to understand the differences between the different lines of credit to ensure you're applying for the one most suited to your needs, and to understand the impact the loan terms may have on your business and finances. Other factors to consider include minimum loan amounts (FNB's Business Revolving Loan starts at R20000), and the term of the loan (at FNB this could be anything from 6 months up to 60 months). GDP for 3Q came in at 2.2% q/q (seasonally adjusted and annualised), just a touch below our forecast of 2.3%, and signalling an end to the recession. The second quarter was revised slightly higher from -0.7% q/q to -0.4%. The primary sector contracted 5.4% q/q, dragged lower by a 8.8% q/q drop in mining output, and despite a 6.5% jump in agricultural growth. The manufacturing sector was the primary driver of growth, expanding 7.5% q/q and adding 0.9 pps, while the electricity and construction sectors contracted by 0.9% and 2.7% respectively. The tertiary sector also contributed to the better growth outcome, with transport jumping 5.7%, trade increasing by 3.2% and finance, real estate and business services up 2.3%. Growth in the government sector remained relatively robust despite the fiscal constraints. The data suggests there is no reason to change our 2018 growth forecast of 0.7% y/y. Many obstacles lie ahead for the domestic economy (electricity supply, confidence, elections, ratings pressure) and we remain below market consensus over the next two years, given the constraints we see these factors having on investment and consumption. You use the information contained on this page (the "Information") at your own risk. First National Bank, a division of FirstRand Bank Limited ("the Bank"), provides no warranties or guarantees, whether express, implied or otherwise, in respect of the Information, its accuracy and/or reliability. Without limitation, the Bank does not warrant that the Information will ensure your compliance with accounting, auditory, financial, legal, business and/or tax requirements or will improve your business' performance. The Information does not constitute advice and should not be used as a substitute for obtaining professional or other advice where necessary. Neither the Bank nor its holding company, subsidiaries or other group companies will be liable to you for any claims, demands, expenses, costs, losses or damages, of whatsoever nature, suffered or incurred by you in respect of your use of the Information. The Bank is the owner of the copyright in all content on this page. You may not publish, modify or adapt this content in any medium or format without the prior written consent of the Bank. President Cyril Ramaphosa has signed into law the National Minimum Wage Bill, the Basic Conditions of Employment Amendment Bill and the Labour Relations Amendment Bill - thereby setting the foundations for the implementation of minimum wages for around 6 (six) million South Africans who currently earn less than the new minimum. The National Minimum Wage Act, 9 of 2018 ("the Act") will come into effect on 1 January 2019. The Basic Conditions of Employment Amendment Act, 7 of 2018 and the Labour Relations Amendment Act, 8 of 2018 will subsequently be implemented following the commencement date of the Act. The national minimum wage has been set at R20 (twenty rand) for every ordinary hour worked. According to the Basic Conditions of Employment Act, 75 of 1997 (as amended), an employee may currently work a maximum of 45 (forty-five) hours per week. This means that the national minimum wage currently equates to around R3,600 (three thousand six hundred rand) per month, depending on the number of hours worked in the month. In addition, any employee who works for less than 4 (four) hours on any day must be paid for 4 (four) hours on that day. The new minimum wage does not apply to farm and agriculture workers (whose minimum wage is currently set at R18 per hour), domestic workers (who are currently entitled to a minimum wage of R15 per hour) and extended public works programme workers such as welfare and care givers (who are currently guaranteed a minimum wage of R11 per hour). However, the Act does provide for the wages of these specific types of workers to be reviewed in the near future in line with certain guidelines for review and adjustment as set out in the Act. The Act also deals separately with learnerships concluded under the Skills Development Act, 97 of 1998. The calculation of the minimum wage excludes any additional amounts that may be paid by employers to employees to cover extras such as transport, equipment, tools, food or accommodation allowances, unless otherwise specified in a sectoral determination. It also excludes any gratuities such as bonuses, tips and gifts. The Act also establishes a National Minimum Wage Commission, whose task is, amongst other things, to review the national minimum wage every year and to determine any applicable exemptions that may be granted. If, as an employer, you fail to comply with the Act's requirements to pay your employees the stipulated minimum wage, a fine will be imposed, unless you have applied for and been granted an exemption. Exemptions can be applied for using the online exemption process which is managed by the Department of Labour. An exemption may only be granted if the delegated authority is satisfied that, as an employer, you cannot afford to pay the minimum wage, and only if every representative trade union has been consulted in a meaningful manner. In instances where there is no trade union representation, there must be proof of meaningful consultation with the affected employees. The consultation process requires the employer to provide affected parties with a copy of the employer's exemption application. The Act does not govern compensation for employees of the South African National Defence Force, the National Intelligence Agency, the South African Secret Service and any volunteers who provide their time and services at no cost. The Act takes precedence over any conflicting provision in a contract of employment, collective agreement, sectoral determination or law, unless the conflicting provision is more favorable to the affected employee/s. According to Malesela Maupa, Head of Insurer Relationships of FNB Insurance Brokers, burglary is a serious threat to any business and can significantly affect operations. He says, "a lot of burglaries and related theft occurs primarily at businesses when they are closed for business. The losses are quite large and happen over a relatively short period." There are some practical measures you can take to protect business premises and property during the holiday season - always remember that thieves do not only steal physical assets, but can also steal electronic data. Having tighter security measures can give business owners peace of mind while away on vacation. Make sure your business is adequately insured: It has become essential for businesses to have adequate insurance cover in place. Insure valuable assets and understand the replacement value of those assets. Make sure you engage your broker to ensure that your business has adequate cover. Lock your valuables: Burglars have become highly aware of vacant offices containing assets such as computers, laptops and stock for the festive season. Place valuable items in a secure room or safe; do not leave expensive items hanging around the office. Activate alarm systems: Test your alarm systems and make sure they are operational, if possible, activate new and stronger passwords and alarm codes. Keep records of all movable assets in case of a robbery: Take an inventory of computers, stock, keys, and gate remotes. Also, list all serial numbers for equipment - this helps to speed up the insurance claim process in the event of theft. Car remote blocking / jamming check that your business vehicles remain locked before walking away. Electronic devices: Laptops/tablets please do not leave these items visible inside your locked vehicle. Kindly place them in a lockable compartment/boot. Yellow plant items kindly remove batteries, tyres, etc. and store it within locked premises. Money Ensure that your safe complies to the minimum safe requirement in terms of your policy, especially considering that you may have an increased amount of cash on premises during the festive season. Keep cash in tills to a minimum. Banking procedures for the season should also be reviewed, and so too the frequency of banking, in order to keep the level of cash on premises to a minimum. Theft of Goods in the Open Give thought to discussing this cover with your broker, i.e. theft of a component from a generator housed outside, theft of CCTV cameras mounted to the outside of the building, etc. "In these tough times when businesses are finding it difficult, the last thing business owners want is to be caught off guard by a robbery. Without taking the necessary precautions and putting tighter security measures in place as well as ensuring adequate insurance cover against potential risks, a business can be left defenseless during this festive season," concludes Maupa. To make sure that your business assets are adequately covered or for any enquiries, please contact one of our FNB Insurance Brokers at fnbibsales@fnb.co.za and quote Business Insurance as a reference. Unless you have chosen to live off the grid, I am sure you can feel we are in the 4th industrial revolution and that the business world is changing. It's an uncertain time and very hard for us to trust that all will be fine if we just keep doing what we have always done. Find out how FNB makes a difference in their business. Sharn Jeffries and Sanjeev Orie discuss Taronga Motors - a three-in-one service station. 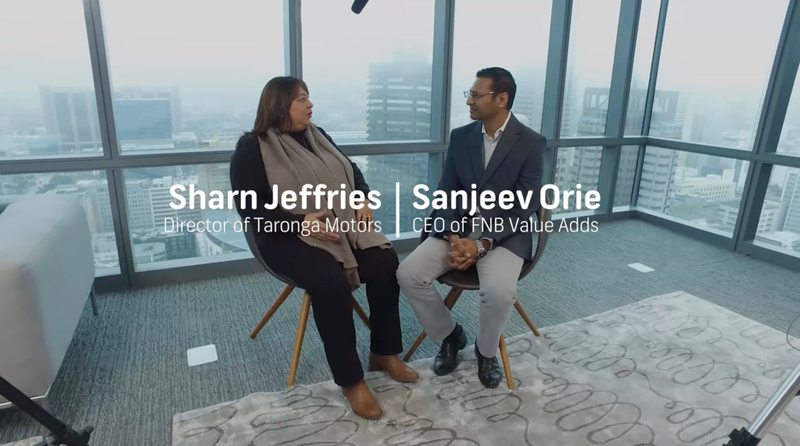 Sharn shares Taronga's journey and tells us why they trust FNB's solutions to take care of accounting and payroll. All companies might be businesses, but not all businesses are, in the legal sense, companies. It's an important distinction, with several implications for business owners, implications that can affect how you optimise revenues and ensure sustainability. The economy expanded by 1.4% q/q (seasonally adjusted annual rate) in 4Q18. This is below our expectations of 2.2% and brings the full-year GDP print to 0.8%. We maintain that economic growth is likely to improve this year, supported by, among others, steady growth in household consumption expenditure. First National Bank - a division of FirstRand Bank Limited. An Authorised Financial Services and Credit Provider 1929/001225/06 (NCRCP20).